Two ELL classes are offered each week on Mondays and Fridays at 6:00. There is no cost to enroll in the classes and everyone is welcome! The classes are held at Grace United Methodist Church. 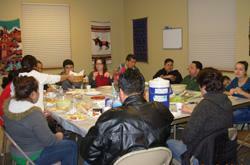 On Dec. 14, the English Language Learners in Sandy Sypherd’s class at Grace UMC in Hastings had a Christmas dinner. Foods from several Spanish speaking countries were featured — pupusas, enchiladas, arroz, tortilla española, salads, refried beans and desserts. Instead of a regular lesson, conversation topics included talking about their favorite restaurants, their preferred cuisine and funny stories involving dishes they were served and were unsure about when they came to the United States. It was great to hear about their humorous and sometimes embarrassing experiences as they practiced their English skills. Learning a second language is a challenge and can be frustrating. It takes a lot of hard work, patience, practice and courage. It means moving out of one’s comfort zone and starting on a new journey. In each class they practice speaking, listening, reading and writing skills and the students are making great progress. Hay dos clases de inglés cada semana, los lunes y los viernes a las seis de la tarde. ¡No cuesta nada para tomar las clases y todos están invitados! Las clases están en la Iglesia Metodista de Grace.